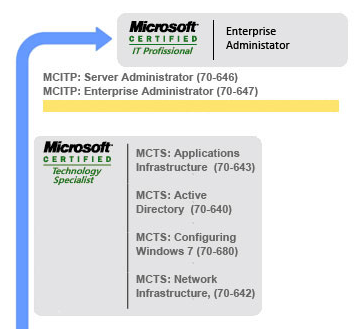 Our 14-day MCSA/MCITP Server 2008: Enterprise Administrator boot camp, students will live, learn, and take the Microsoft exams at one of our state-of-the-art education centers. When you have completed the couse, passing the 6 exams, you will have earned your Microsoft Certified Solutions Associate (MCSA) and Microsoft Certified IT Professional (MCITP) credentials for both Windows Server 2008 and Windows 7. This widely recognized certification objectively validates your ability to design, evaluate, maintain and troubleshoot Windows Server 2008 and also install, deploy, and upgrade to Windows 7 utilizing the most current technologies available. Allows you to earn multiple certification, demonstrating your abilities across multiple roles. Builds on a combination of Microsoft Certified Technology Specialist prerequisites, helping you develop your technical resumé with each step in your career path. Server administrators are recognized among their peers and managers as leaders in the day-to-day operations management of Windows Server 2008. Demonstrate and communicate your ability to take system-wide ownership of Windows Server 2008 administration, and increase your organizations return on technology investment, by earning the Server Administrator certification. MCITP Windows Server 2008 Self Paced Online or CD-ROM Training for Certification. Many accelerated training providers rely heavily on lecture and independent self-testing and study.